BEIJING (AP) — A powerful typhoon toppled houses, flooded villages and forced nearly 1 million people to flee to safety on China’s eastern coast before weakening into a tropical storm Monday. Named Morakot, the storm struck after triggering the worst flooding in Taiwan in 50 years, leaving dozens missing and bringing down a six-story hotel. It earlier lashed the Philippines, killing at least 22 people. Morakot, or emerald in Thai, slammed into China’s Fujian province Sunday afternoon as a typhoon carrying heavy rain and winds of 74 miles (119 kilometers) per hour, according the China Meteorological Administration. At least one child died after a house collapsed in Zhejiang province. By early Monday, the storm packed winds of 52 miles per hour (83 kilometers per hour) and churned at about 6 mph (10 kph), it said. 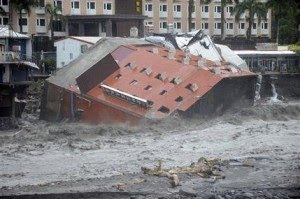 Hundreds of villages and towns were flooded and more than 2,000 houses collapsed, the official Xinhua News Agency said. People stumbled with flashlights as the storm enveloped the town of Beibi in Fujian in darkness, Xinhua said. Strong winds uprooted trees or snapped them apart, while farmers used buckets to catch fish swept out of fish farms by high waves. About 1 million people were evacuated from China’s eastern coastal provinces. Morakot hit Taiwan late Friday and crossed the island Saturday causing the worst flooding in half a century. Authorities used helicopters to drop food Monday at a mountainous village in southern Kaohsiung county, which was hit by a massive landslide. Official Yang Chiu-hsing said rescuers failed to reach the 1,300 villagers because bridges and roads were damaged by floods. Taiwan’s Disaster Relief Center said Morakot killed 12 people and another 52 were missing, including 14 people whose makeshift home was swept away. Two policemen were washed away while helping to evacuate villagers in southeastern Taitung county. The government set up a task force to coordinate relief work in the worst-hit counties in the south, where many towns and villages remained inundated by floodwaters, officials said. In Japan, meanwhile, Typhoon Etau slammed into the western coast Monday. Nine people were killed in raging floodwaters and landslides and nine others were missing, police said. In the northern Philippines, the death toll from Morakot rose to 22 Monday with 18 injured and four missing, including three European tourists who were swept away. Associated Press writers Annie Huang in Taipei, Jim Gomez in Manila, and Shino Yuasa in Tokyo contributed to this report.